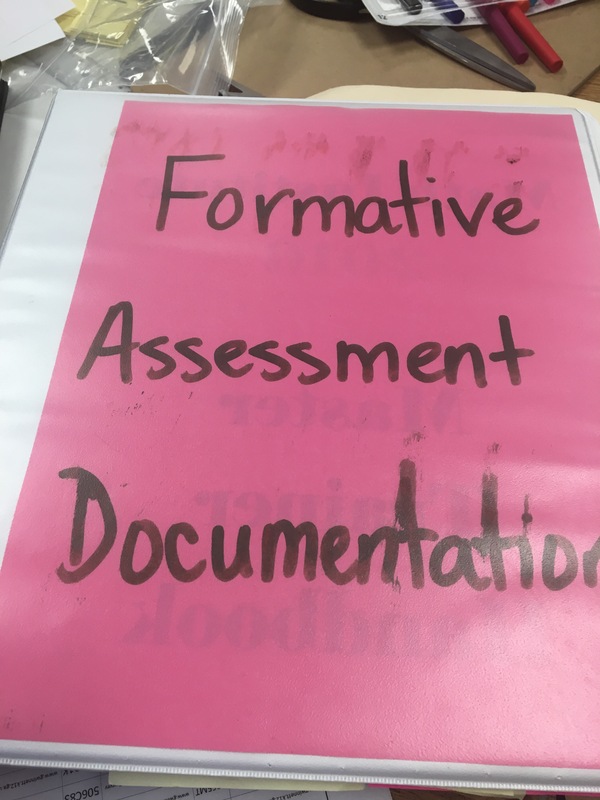 For me, formative assessment is not just one of the latest buzz words I use to sound like I know what I’m doing. It’s what I actually use to “know” what I’m doing. Without feedback from my students I feel like I’m walking in the dark, alone. So I formatively assessment more often than our required Friday CFAs, common formative assessments. 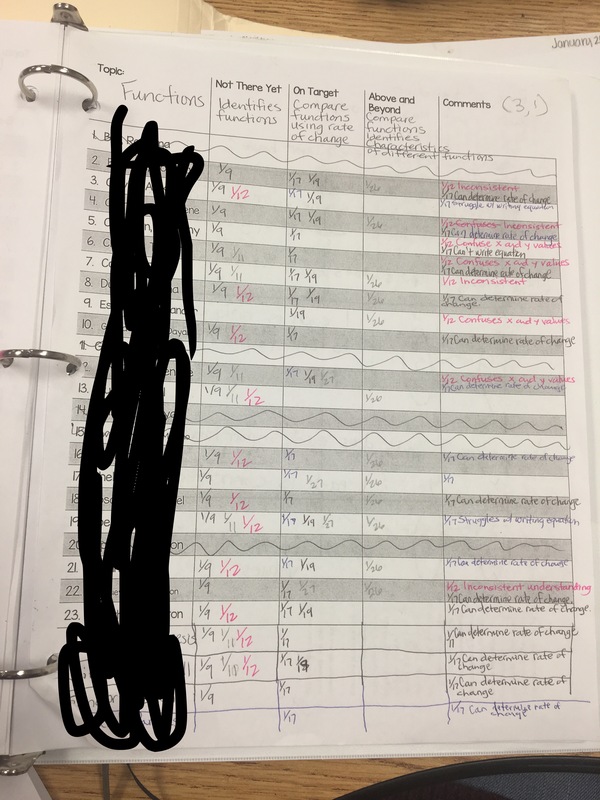 In addition to the ticket out the door, observation rubrics, FALs and FAs of that sort (which never, ever count for a grade and still my students do them without griping or apathy…but I digress) I use weekly concept quizzes to capture student understanding of the concept of focus for the week. 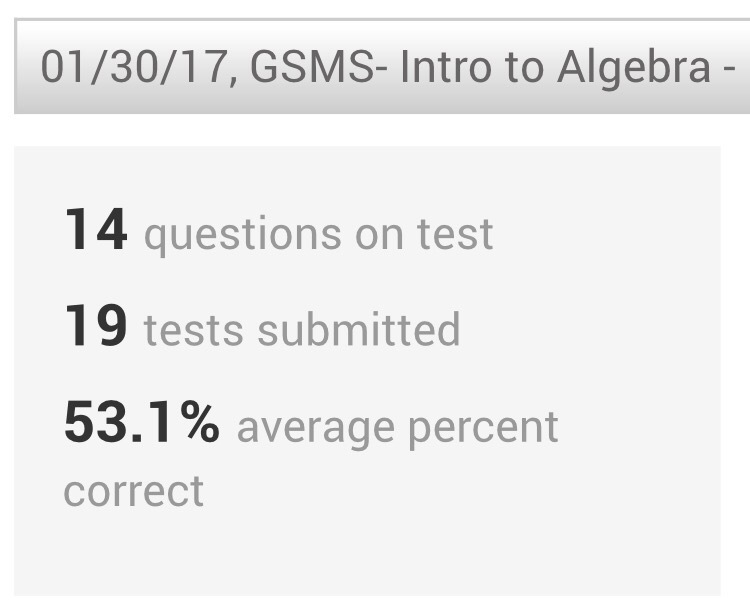 These are entered into the gradebook. 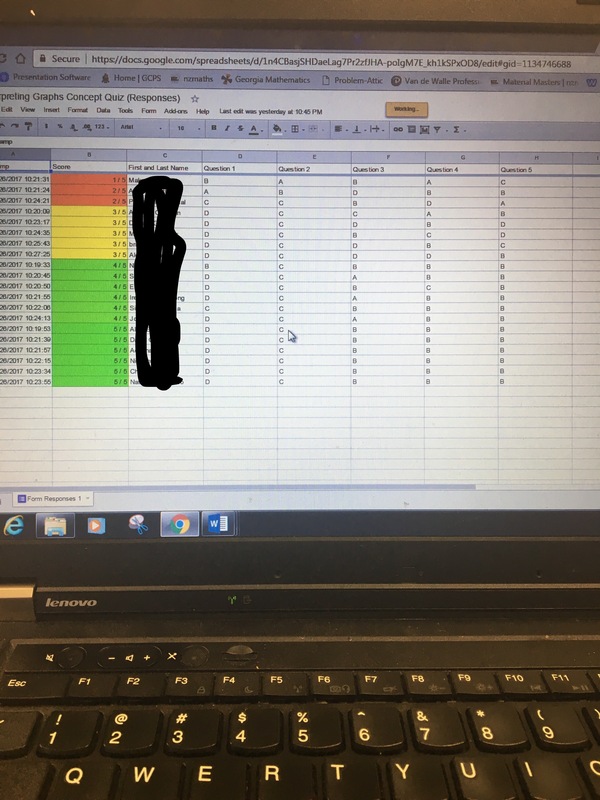 Here lately, I’ve been using Google Forms to create my quizzes which provide a wonderful spreadsheet to which I can add conditional formatting that gives me this look to easily identify students’ levels of understanding. Therefore, as I go through a unit, I have a pretty good idea of who will show mastery on the common assessment (our unit test) and who will need more time before reaching mastery. This year, the FAs and CQs have been accurate. That was until this Unit 6 assessment. 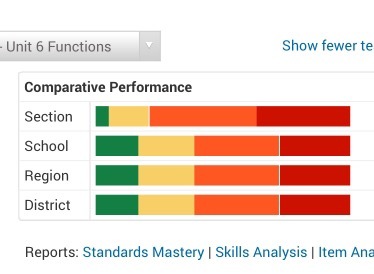 Although all signs pointed to majority of the students showing mastery, this data proved differently. Yikes!! 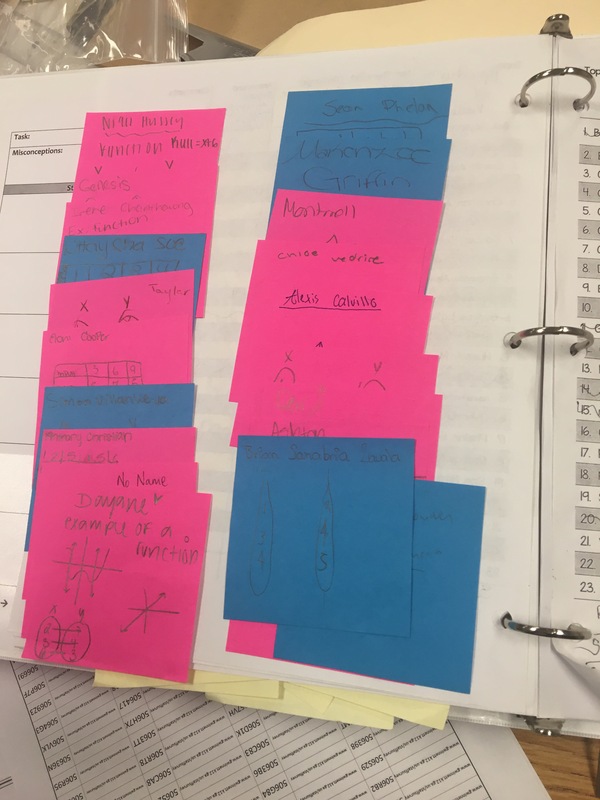 My knee jerk reaction was to have students complete test corrections, discuss common misunderstandings as a class, get student feedback on the test and reassess. The retest results further proved the lack of sense making of written scenarios and the confusion between rate of change and initial value on a graph. Does this prove that formative assessments aren’t useful and don’t help prepare students for success? Not at all. Is this an opportunity to reflect, adjust and grow as an educator to help my students be successful? Hell yes (sorry mom). This is clearly an instructors error as proven by the data from both the FAs and the CA. As we build more understanding by looking at this concept through a different lens, I’ll post about our accomplishments. The end of the year is fast approaching, which prompts continual reflection for me. I can honestly say I have no regrets. I wouldn’t change anything, I would only make adjustments. Provide a rubric and explanation of the standards for parents in terms they can understand. Incorporate the observation rubric more. Less papers you have to grade for formative assignments (required by district). Emphasize backwards design. This will help determine what needs to be emphasized “instructionally” and what does not. This will also help me balance conceptual understanding with procedural fluency. Have 3 options for demonstration of understanding. Make it quick (use of technology), concise and manageable (this I’m still thinking through). Incorporate more of it. Think of building conceptual understanding and practice like tasty lemonade, it has to have the right blend of lemonade flavor, sugar and water. Conceptual understanding, problem solving and practice or procedural fluency. Be more consistent and don’t be afraid to try with all classes. Don’t get stuck on having accountability pieces. Always remember we are teaching mathematics so it can be applied outside of the school setting as well. We are developing thinkers and problem solvers. Students (and parents) may be resistant in the beginning, which could be due to their inability to see the big picture. We must still push on, plant the seeds and water our crops. Teach without regrets, reflect and make adjustments. This post dedicated to Pam White. Last Thursday I hit a wall. After two weeks of working on writing expressions within small group rotation, I realized the kids were still missing it. Well actually, it was I who was missing it. With quiet time and prayer, reflection and conversations with my husband, I learned 3 key things. 1. I need to listen to what my students are saying. My husband challenged me to ask my students what they felt was working for them and what wasn’t. When I inquired their opinion of small group, the responses were enlightening. Students expressed they struggled with using Edmodo for numerous reasons. From login fumbles to computer hiccups to not understanding the layout fully which caused frustration among many. Not understanding the purpose of games was shocking to me. Although I felt I had discussed their purpose it still was not evident to the students. When I compared playing the games to completing 10-20 practice problems, many lightbulbs turned on. The biggest aha moment was when the students said, “when we’re doing independent work we need someone right here (patting the desk next to them) to help us get there it!” Even with a mini-lesson and modifying the tasks, it still wasn’t enough for them to think through it without explicit guidance. And vary the technology. 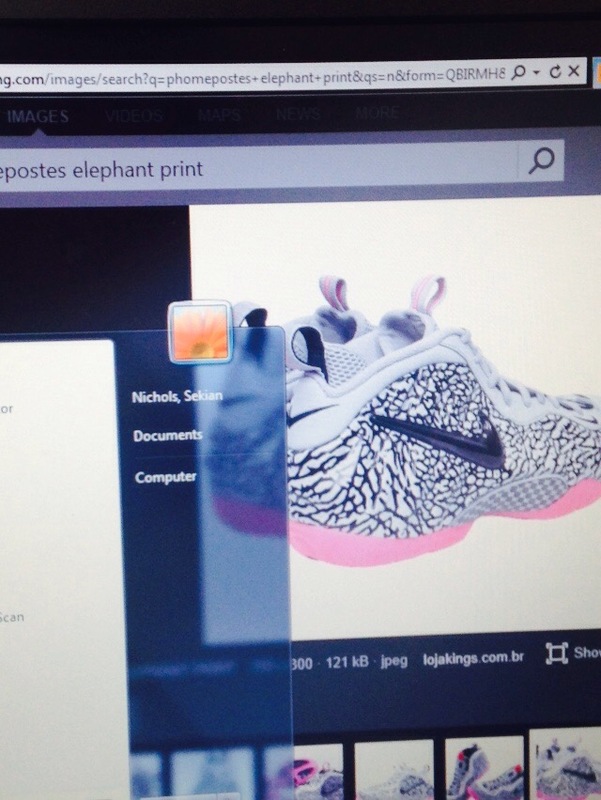 If they’re frustrated with one aspect, they’ll begin to surf the web for other things. 2. It can take more than 21 days to break a habit. It’s been 7 years of procedural teaching, where the correct answer was the only thing you needed to know. 7 years of synapses pathways carved out in their brains from doing the same thing over and over again. Although I knew this, it wasn’t until my quiet time that I finally accepted that fact. We’ve been engaging in tasks, doing Number Talks, implementing the SMPs and yet they revert back to their old way of thinking. The bible says to change the way you thinking by the renewing of your mind. This renewing has to be daily and it takes time. My goal of October to have students at the point of those who’ve had conceptual teaching for years had come and gone. The picture I painted in my mind had been splattered with red paint. It was time to paint a new picture. 3. I lost sight of the ultimate goal. Solution: Refocus on what’s important. They’re farther than they were at the beginning of the year, so you know they will continue to grow from where they are now. 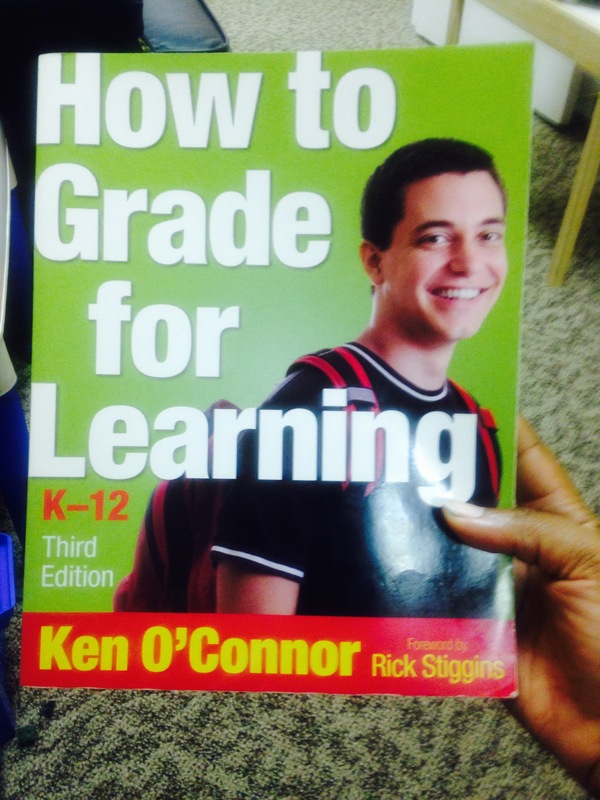 How to grade for learning is so important. I’ve shifted over the years as I learned what’s important to include in the grade and what is not. Now, students’ grades are solely based on their demonstration of their understanding. I don’t deduct points if they write in pen. I don’t take off if the assignment is late. And I do not give extra credit. Currently, students decide which assignment they want scored from work collected in their portfolio from Wednesday to Wednesday. I use the rubric created using the Standards of Mathematical Practice and record the score in the grade book. How I manage the various assignments turned in, I list them as checkpoint 1, checkpoint 2 and so on. Note to self, stating 2nd quarter, why not log the score in the grade book using the learning target it addresses. So all assignments and scores relating to simplifying expressions will be entered under the target “simplifying expressions”. This will ensure the information record is accurate to how the student is performing on specific learning targets. Ideas spawned from reading this book.